Ducks Unlimited Canada won first place at the 2013 Esri International User Conference for Single Map Product category & Special Interest Group Award. 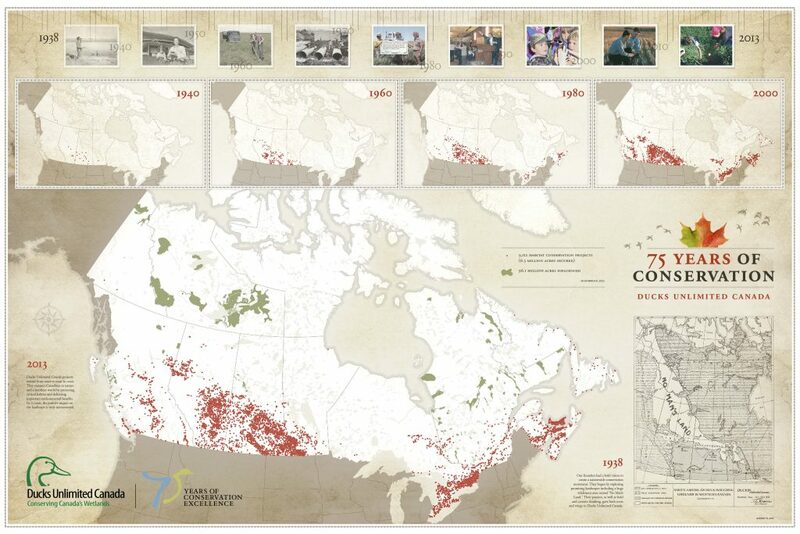 Geographic knowledge plays a role in nearly every decision we make at Ducks Unlimited Canada. Choosing project locations, targeting marketing strategies, studying waterfowl movements, tracking landscape changes—all of these activities involve questions of geography. With the integration of digital mapping, Global Positioning Systems (GPS), remote sensing, geographic analysis and location-based applications, Geographic Information Systems (GIS) has become a valuable conservation tool. The Smith Creek (SCRB) Wetland Loss Viewer application displays wetland loss and hydrography change measured between 1958 and 2009. The mapping for both time periods are displayed side by side so that the user can easily visualize the dramatic changes that have occurred in the watershed. The Broughtons Creek Watershed Wetland Loss Viewer application displays two wetland inventories for 1968 and 2005. These two inventories are displayed side by side so that you can easily compare the two time frames to see the dramatic impacts that have occurred on the watershed. The purpose of the Canadian Wetland Inventory (CWI) Progress Map is to display CWI-compatible wetland inventory areas that are completed or in-progress across Canada. This map application also permits the visualization of detailed wetland polygons and attribute information for certain areas where wetland inventory data have been made available. Data used to build the CWI progress map have been compiled from CWI partners with the intent of making wetland information readily available to a broad range of users in the form of an interactive map. Source and partnership information for the various wetland inventory datasets have been provided within the map application. In cooperation with the United States Geological Survey (USGS), we have developed an interactive map system to show you the migration of ducks banded from Canada to the United States between 1986 and 2003. The Southern Quebec Wetland Map Viewer provides detailed information about the location, type and state of wetlands in this highly settled region of Canada. The wetland inventory was conducted by DUC and MDDELCC (Environment Quebec) using cutting-edge technology based on three-dimensional photo-interpretation of recent high-resolution aerial photography. The resulting dataset accurately maps wetlands greater than 0.5 hectare. DUC’s GIS team has prepared a story map to follow the travels of the paddles that are the namesake of our “Dip Your Paddle” campaign. Staff members are using the paddles to show where they work and play, and to share what drives them to care about conservation. The paddles have already been photographed and signed at more than 80 locations across Canada.